Celebrated Restaurateur Sondra Bernstein has added Wine Studio & Farm to her Wine Country offerings! beyond, the The Rhône Room is an intimate space, part wine studio, part lounge, part working farm, that will serve as a tasting room for visitors to enjoy a selection of the girl & the fig's house Rhônes and exclusive lesser-known offerings from local Rhône producers. The Rhône Room will also highlight regional and French varietals and blends from the Rhône Region of France. As in all of her undertakings, Bernstein’s seamless conceptual blending of rustic and refined create an atmosphere of warmth and sophistication, with a stunning antique tasting bar taking center stage, picture windows showcasing “the fig’s” expansive culinary gardens just outside, a comfy over-sized booth strewn with brightly colored pillows, and outside seating. support and advancement of California Rhônes. Since 1997 and the opening of the original the girl & the fig restaurant in downtown Glen Ellen, Bernstein’s figgy endeavors have expanded to include two busy restaurants, a catering division, event venue, organic farm, and food truck. In the heart of Sonoma Valley, at the epicenter of a thriving local food and wine scene, you’ll find the girl & the fig. Founded by Restaurateur Sondra Bernstein and now in its twentieth year, the historic downtown location turned contemporary eatery has become a beloved favorite of locals and the must-visit destination of travelers. The seasonally-driven menu is sourced locally and delivers a decidedly Sonoma flair, featuring an exclusively “Rhône Alone” wine list , artisan cheeses , and an in-house charcuterie program. The Rhône Room will serve as an extension of the restaurants’ celebration of Rhône wines, approachable, artful living, and appreciation of Sonoma’s growing seasons. 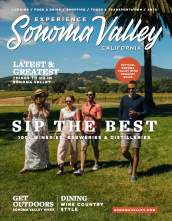 Located at the Sonoma Roadside property (where one can also visit shopping destinations Harvest Home and the Fat Pilgrim), the girl & the fig’s culinary garden, which supplies all of their kitchens, is steps from the Rhône Room and open to visitors. the girl & the fig family of restaurants also includes the fig café & winebar in Glen Ellen, the girl & the fig CATERS! in Sonoma, a food truck dubbed “the fig rig,” as well as an event venue, Suite D, and The Rhone Room.